I was yesterday at the General Court with my LL.M. students from Liege. We attended the hearing in CISAC v. Commission. Here’s a grab bag of ruminations on the CISAC case, and some information on the Court. Let’s start with the case. In this case, the Commission argues that national collecting societies have entered into an unlawful concerted practice “‘by coordinating the territorial delineations of the reciprocal representation mandates granted to one another“. The evidence brought in support of this finding hinges primarily on proof of parallel conduct, through the adoption of similar reciprocal representation contracts by the collecting societies. During the hearing, the Judges repeatedly questioned the Commission on why it had brought no other evidence of concerted practice, in particular, documentary evidence. The judges found that surprising, especially given that the Commission enjoyed the implicit support of two collecting societies, i.e. BUMA and SABAM. The Commission awkwardly conceded that there could not be any evidence of this kind, because it was not necessary for the collecting societies to “agree” on the terms of the reciprocal representation contracts (I heard something like: “there was nothing to agree upon“). If I understand correctly, those terms – and more generally, the monoterritorial agreements – had been applied previously in other types of contracts, and it was simply the most rational decision for each collecting society to replicate them individually in the impugned reciprocal contracts. In so saying, however, the Commission made a daft mistake. It implicitly admitted that the wide-ranging parallel adoption of dozens of similar reciprocal contracts had an explanation alternative to concertation (i.e. individual, rational behavior from collecting societies) … and that it had not discharged the burden of proof required under the Woodpulp case-law. The main applicant’s lawyer rightly noted, moreover, that territorial exclusivity makes a lot of sense from a rational, individual standpoint. Alfonso referred to the reform of the Court a few days ago. Here’s some fresh information on the reform. The General Court and the Court of Justice now have an agreement to propose the appointment of 12 new judges +3 référendaires for each (and importantly, 12 cars (without a driver though)). Those 12 new judges will surely be appointed under a rotation model, similar to the one that prevails at the Civil Service Tribunal. There will be new jobs for référendaires thus, in particular in fields such as competition law. As pointed out by Alfonso, being a French native speaker is a HUGE asset. In fact, in each cabinet, there’s generally at least on French speaking guy. And this is unlikely to change. I heard that the new selection panel – which assesses candidate judges – drafted a report stressing that new appointed judges should hold two skills: a very good French and a strong publication track-record. As a French speaking academic, I could simply commend the work of those authors. That said, I will never hold a such prestigious position :(, given (i) my insulation from the French legal system; and (ii) that I have not followed THE standard professional avenue to the ECJ, i.e. Council of State or Ecole de la magistrature. At the ECJ, a vice-president will be appointed. New (I heard five) AG’s positions will be created. Other aspects of the reform may entail suppressing the rapport d’audience, providing for an accelerated preliminary reference procedure (duration ❤ months), limiting the size of written pleadings, etc. It will be up to the heads of State to decide on this. 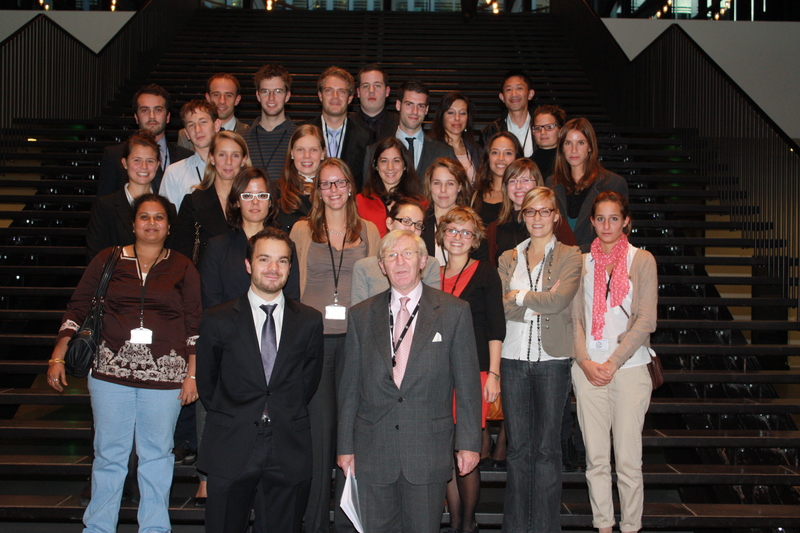 PS=> hereafter a picture of my LL.M studs with Judge Jean-Jacques KASEL (Court of Justice of the EU). thanks for the insider’s comments on the hearing!! Must have been a great experience!